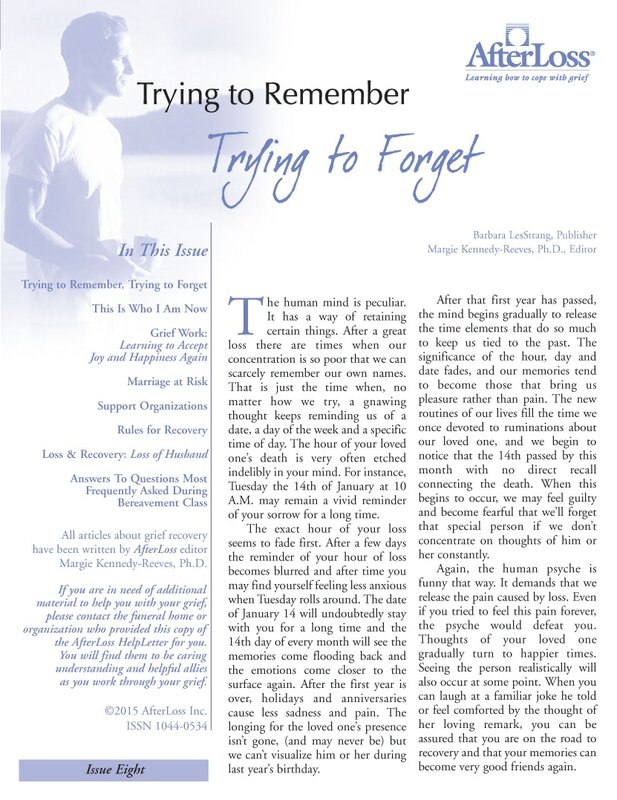 If you have lost someone very dear to you through death, you are probably going though an intensely emotional - and certainly a very painful - period in your life. 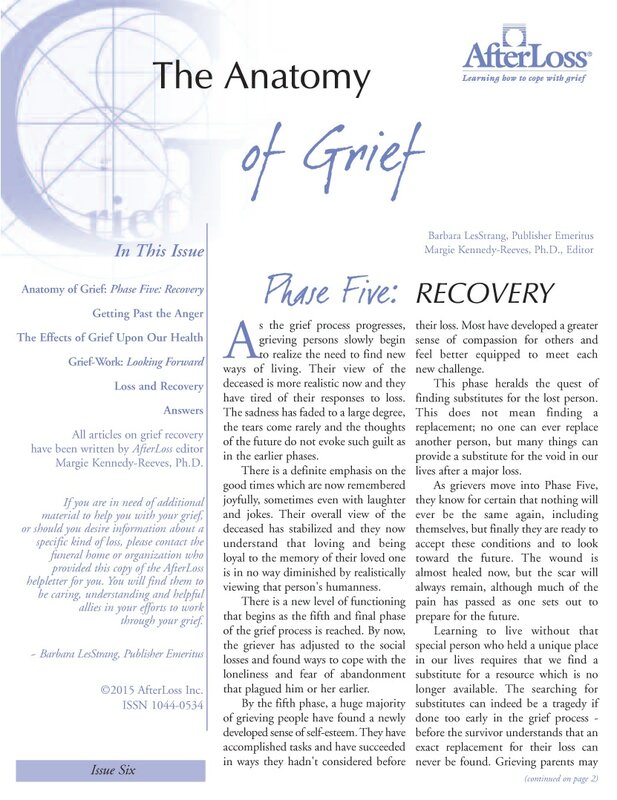 Until we suffer a grief of our own, we know little about its requirements. That's why the AfterLoss Program was developed. 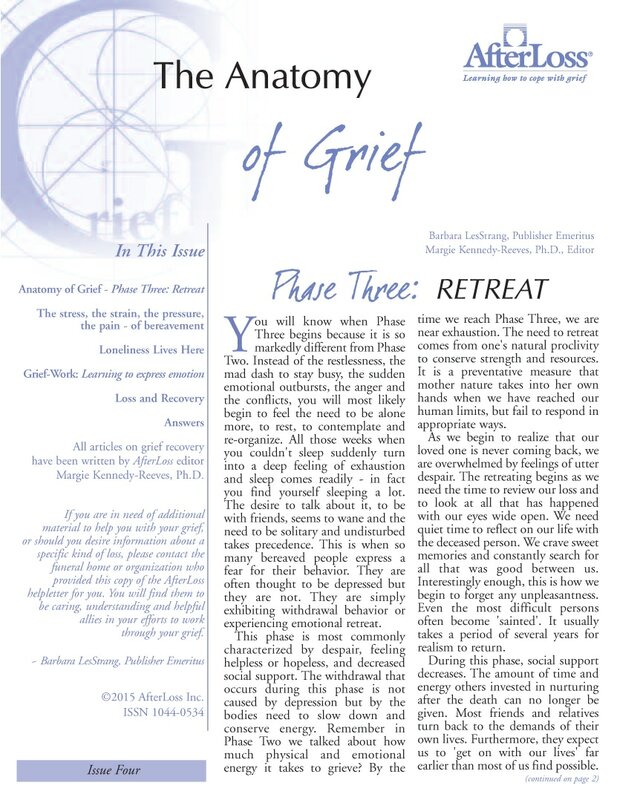 Each HelpLetter® outlines a stage of grief that may be happening and helps the reader to understand how they may be feeling and gives valuable ways to cope. Below are descriptions for each issue. 6 months and 12 month subscriptions are available in English and French. 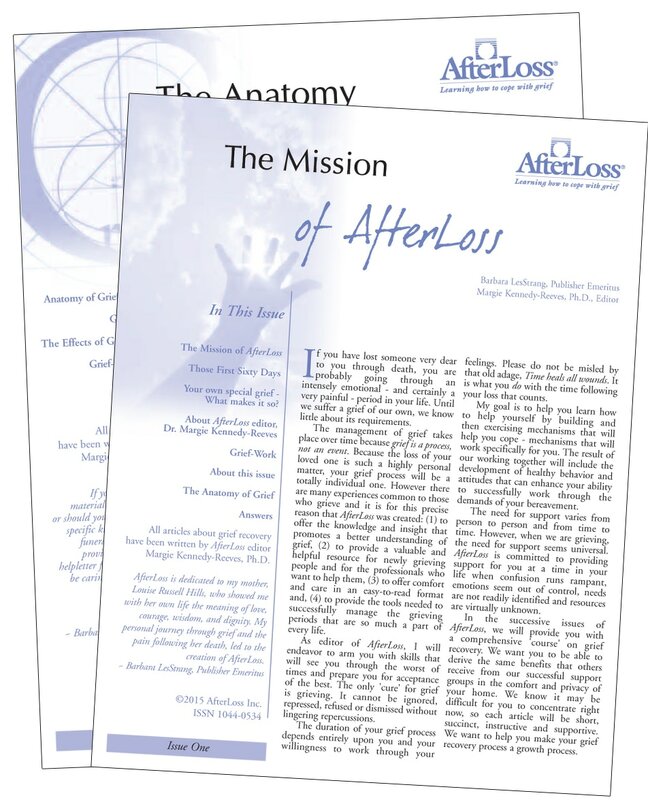 ANYONE CAN ORDER A SUBSCRIPTION of the AfterLoss HelpLetter. It is available in a 6 month and 12 month subscription. Simply contact us and we can help you. 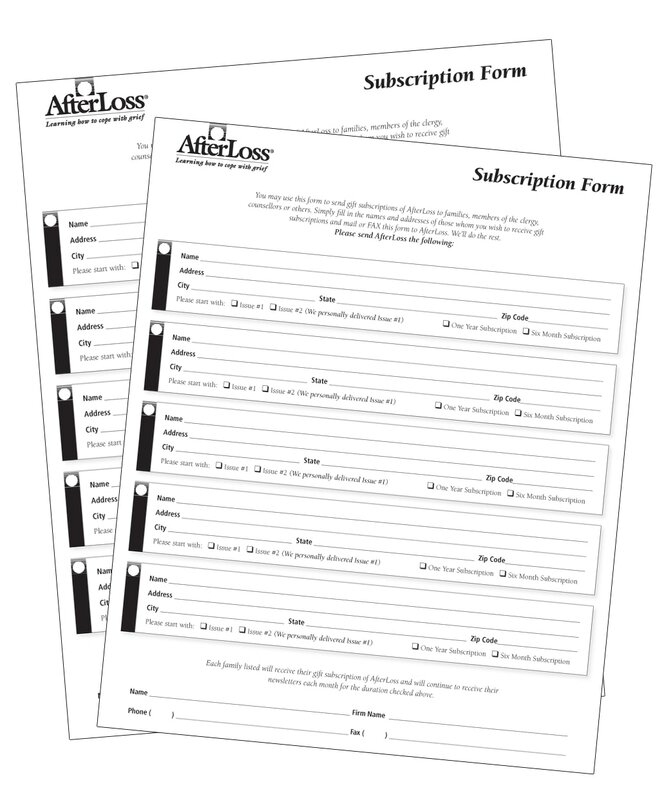 If you are a funeral home, faith based organization, cemetery, hospital or organization in need of AfterLoss® for your families and community, simply request our free subscription kit which includes 50 keepsake gift cards for you to give to your families to announce the coming subscription, and a convenient subscription pad. Below are our AfterLoss Issues. 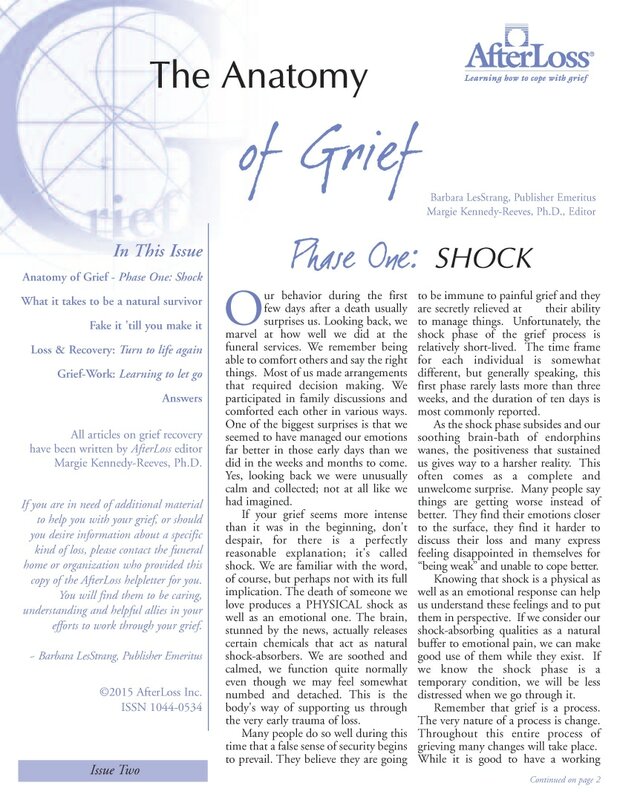 Each 8 page issue outlines a stage of grief that may be happening to the reader. 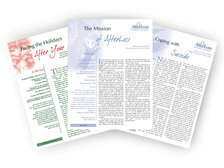 Subscriptions are available for 6 months, 12 months and individual issues may be purchased. 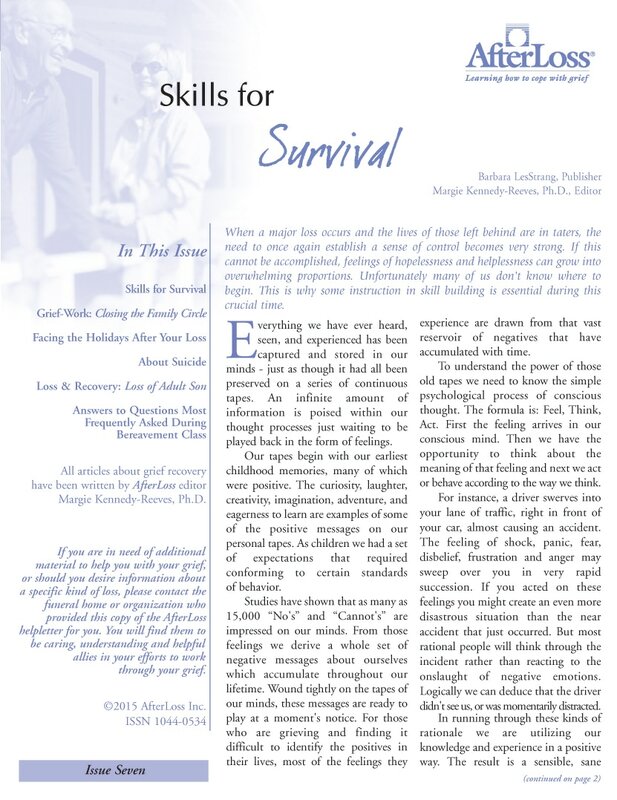 Specialty issues are also available. 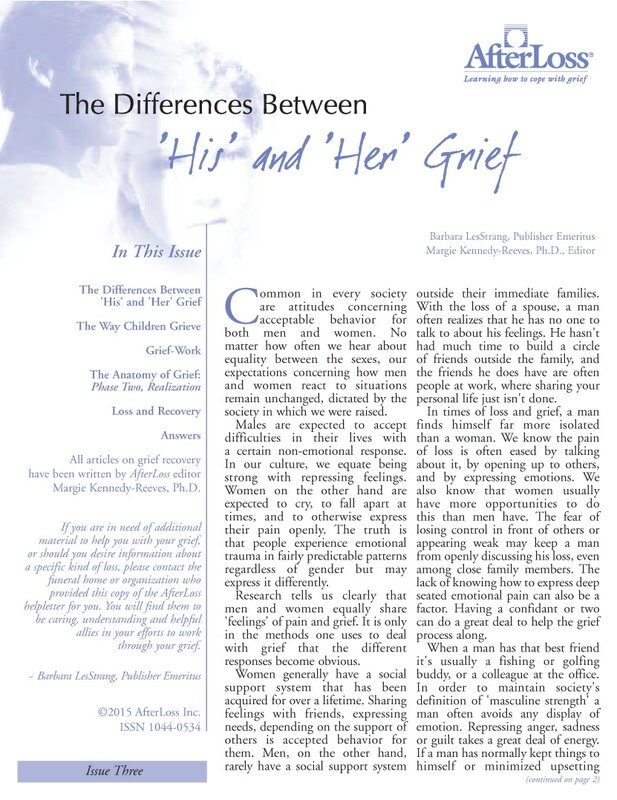 A first page sample of each issue is shown below - CLICK TO VIEW LARGER. 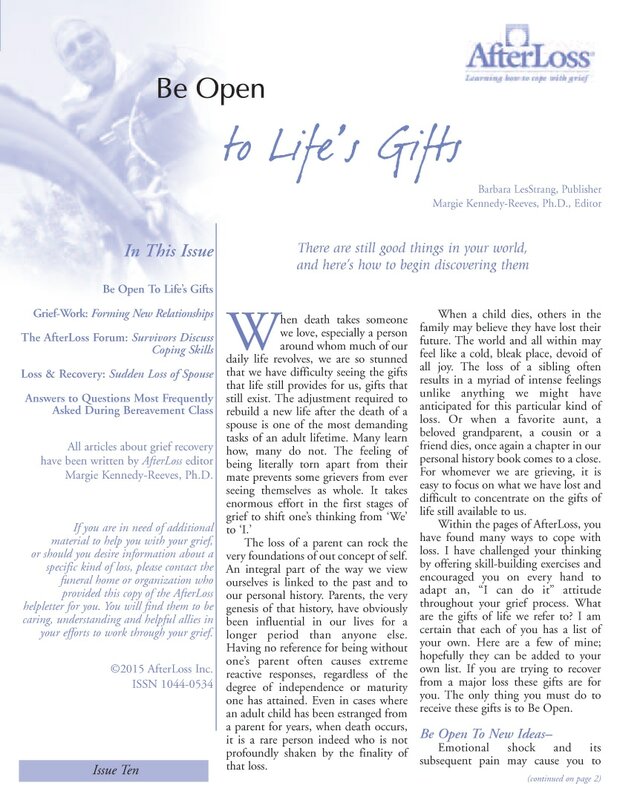 Many subscriptions are given as gifts to help through loss ANYONE CAN ORDER A SUBSCRIPTION of the AfterLoss HelpLetter. It is available in a 6 month and 12 month subscription. Simply contact us and we can help you. 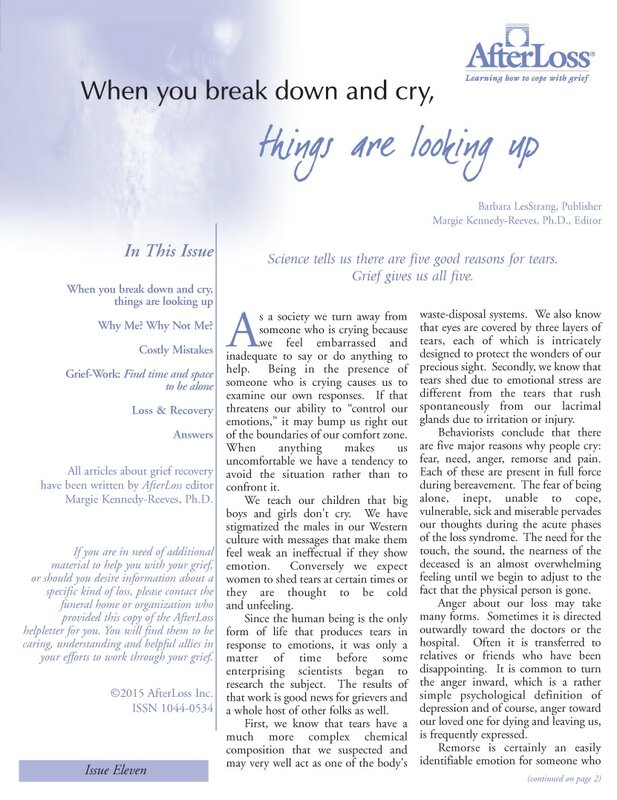 "A monthly HelpLetter rater than a quarterly one better serves the needs of grief-stricken people or families." 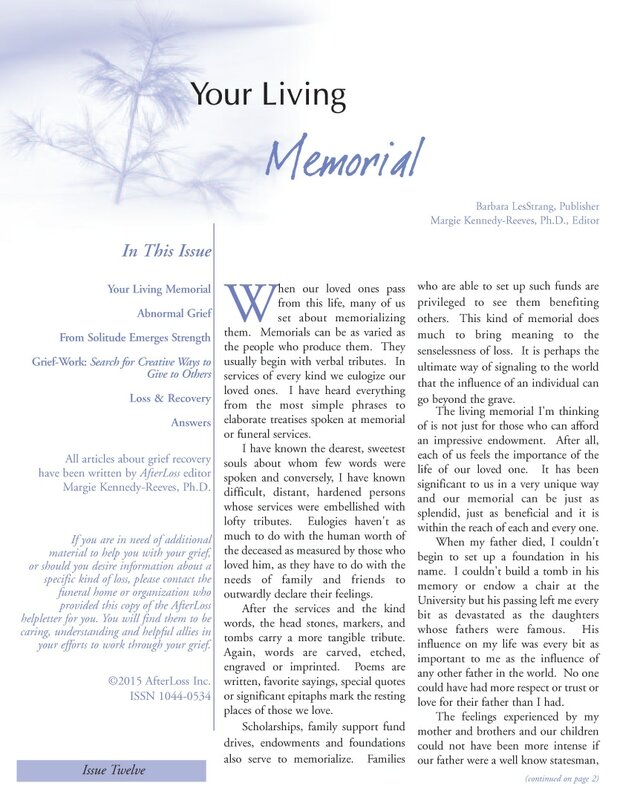 AfterLoss's editor was Dr. Kennedy-Reeves, a highly respected thanatologist. 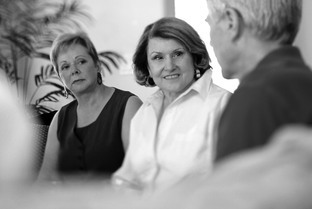 She was the crisis counsellor and facilitator of all of the bereavement classes at the Eisenhower Medical Center in Rancho Mirage, California (the location of the Betty Ford Center and the Barbara Sinatra Child Abuse Center). 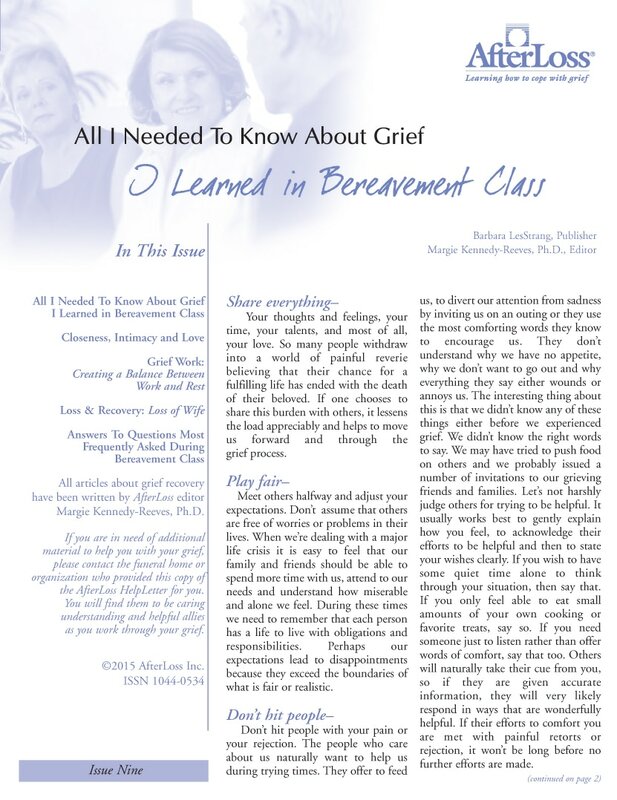 The AfterLoss HelpLetters provide the same grief recovery information received in these bereavement classes and answers many questions asked during the classes. We take the class to the people through AfterLoss. 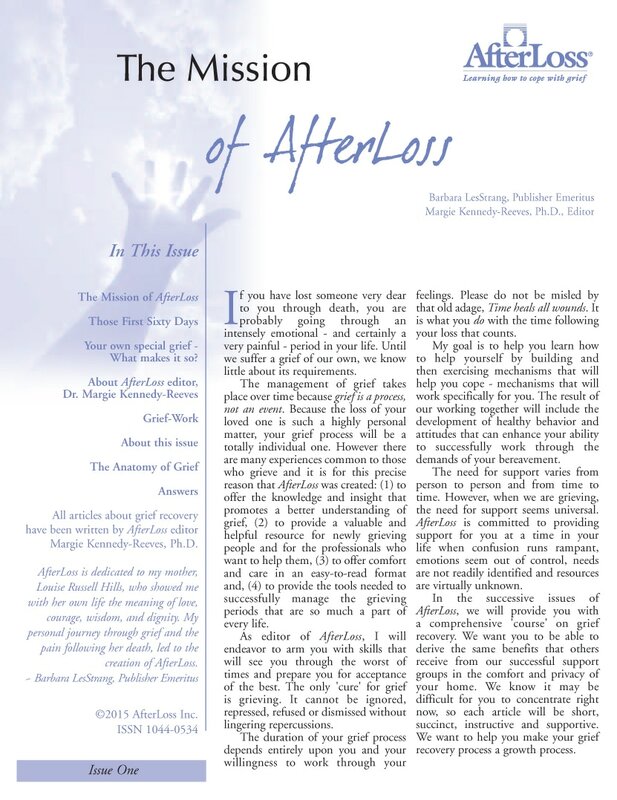 AfterLoss teaches that grief is a process, not an event. 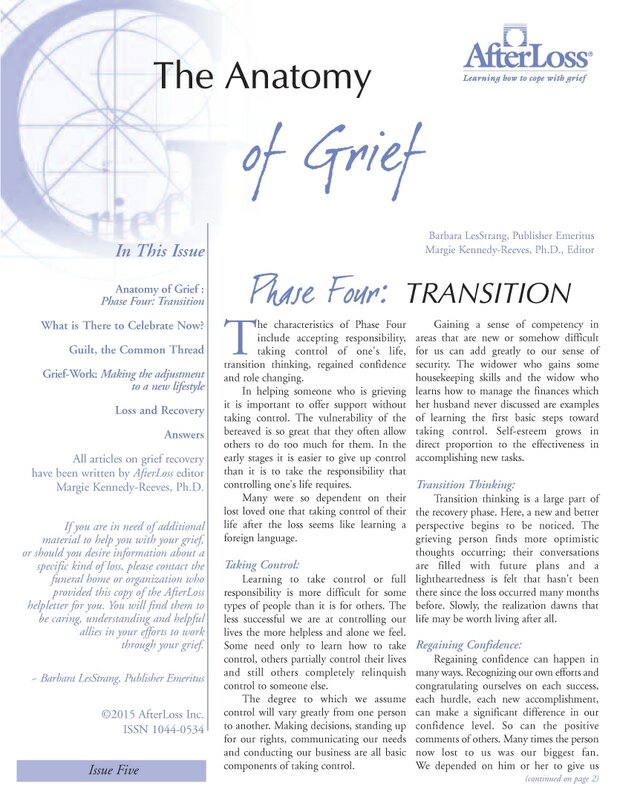 Specific questions about loneliness or fear, guilt or anger and other topics are answered, bringing comfort, encouragement and most of all, insights about grief.